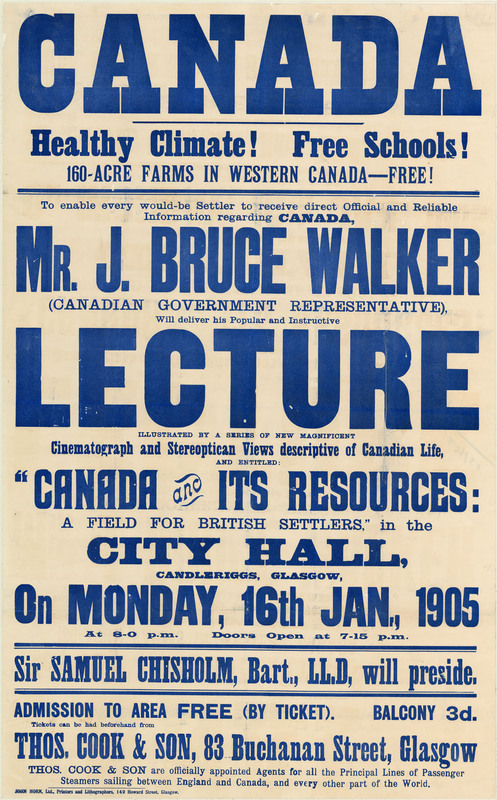 “160-ACRE FARMS IN WESTERN CANADA – FREE!” So trumpeted one of the many posters printed by Canada’s Department of the Interior to entice immigrants to Western Canada. 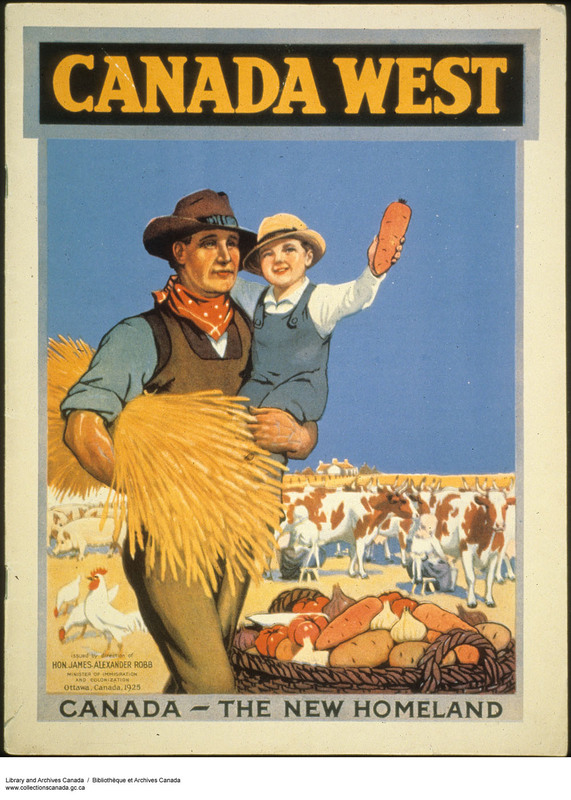 Between 1886 and the early 1930s, the Department of the Interior ran a vast publicity campaign to attract immigrant farming families to settle in the Prairies. Posters, pamphlets, leaflets, and exhibits in multiple languages were distributed across Europe and the United States to recruit as many immigrants as possible. Settlements linked directly to this campaign include 500 Ukrainian families who arrived in Dauphin, Manitoba in May of 1897, and the Barr Colony, a group of British settlers who arrived in present-day Lloydminster, Alberta in May of 1903. As the steward of government records, Library and Archives Canada holds a large collection of the promotional materials used during this publicity campaign. The materials were designed to promote an idealized version of the West. Images of lush green landscapes, well-fed cattle, and harvests of golden grain were commonly used. Negative aspects of the Prairies, such as cold weather and isolation, were downplayed. Private companies were involved in the campaign too. 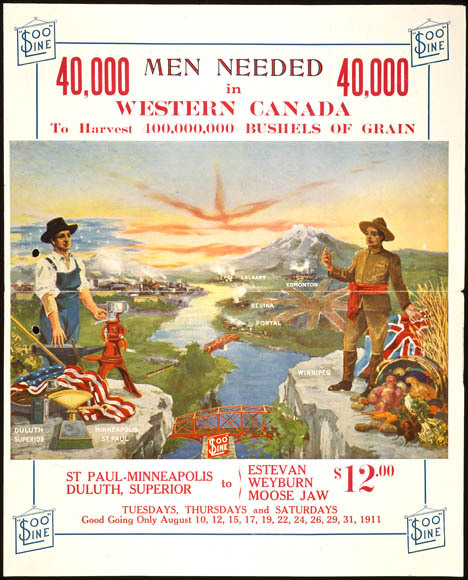 Shipping and rail companies used these same government-issued images to encourage settlers to come to Canada. 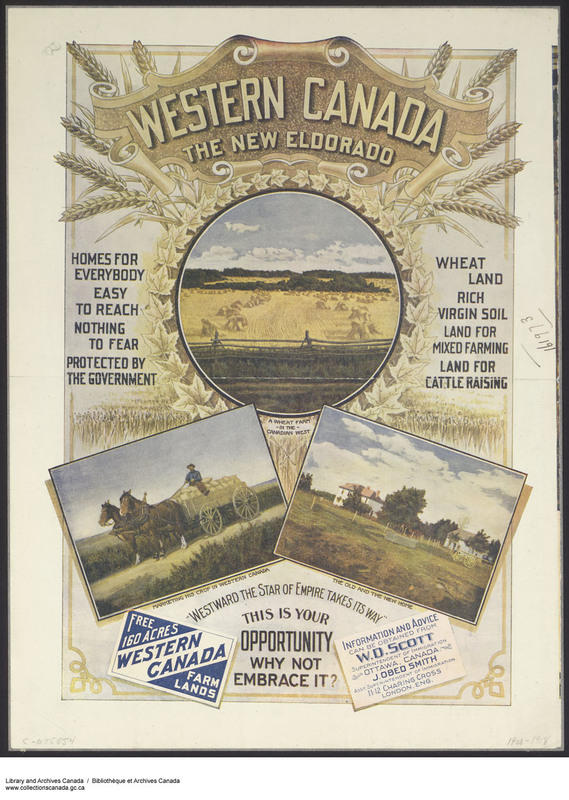 Recruitment tactics changed over time as the Prairies developed and printing techniques improved. Most early posters of the 1880s and 1890s (like the first image) were limited to text and small pictures. 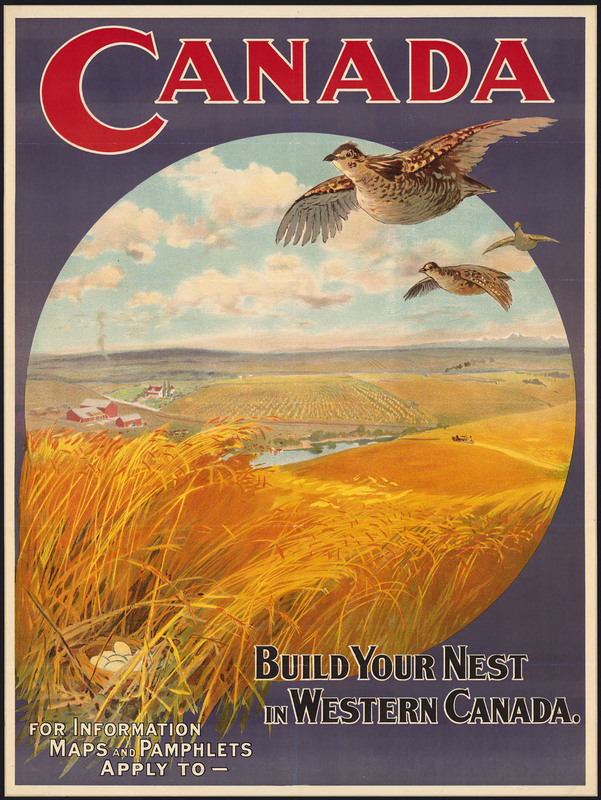 These posters featured information on the West, and promoted the benefits of free land. Different colours and sizes of print combined with small symbols and pictures were used to get people’s attention. As printing technology improved, large colourful pictures replaced words. Some posters used a mix of text and pictures, with each section boxed to create a patchwork effect. Other posters, especially later examples, used brightly coloured pictures with short slogans and the name of the department or company. The campaign worked. The immigration of Ukrainian settlers and Barr colonists was just the beginning; thousands more settled in the Prairies, motivated by the promise of free land and a new life. Yet many did not succeed. Drawn by an idealized version of the West portrayed in the campaign, the newcomers were unprepared for the realities of their new home. However, those who did succeed changed society and helped shape the Prairies into what they are today.